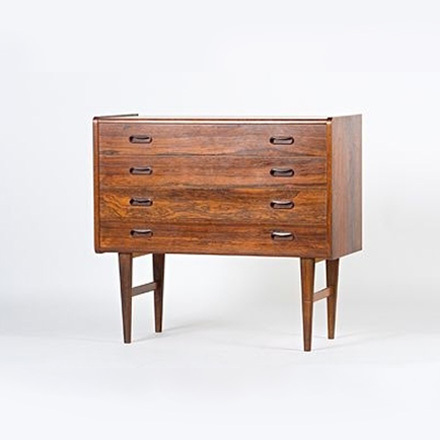 Kai Kristiansen’s designs have become some of the most well known pieces to be created in the mid part of the 20th century and his name has become synonymous with Danish modern. He trained as a cabinet maker, graduating in 1948 and then went on to train under Kaare Klint at the Danish Academy of Fine Arts. He went on to open his own office and designed for many companies such as Skovmand and Andersen Møbelfabrik, Feldballes, Magnus Olesen, Fritz Hansen, Axel Kjærsgaard and Heltborg. He designed many pieces of furniture such as sideboards, desks, chairs, tables, shelving units and cabinetry. His FM shelving system was widely popular not only in Scandinavia but also throughout North America and the rest of Europe for it’s flexiblility and design. But surely his most beloved and popular design is the model 42 chair for Skovmand and Andersen. Sought after for not only it’s beautiful looks, but it’s comfort, it has become one of the most iconic Danish modern pieces of furniture.